On the bottom of any feed item, click on "Share with Note" and the screen above pops up. You can then give some feedback into why you're sharing the particular blog post or news story. 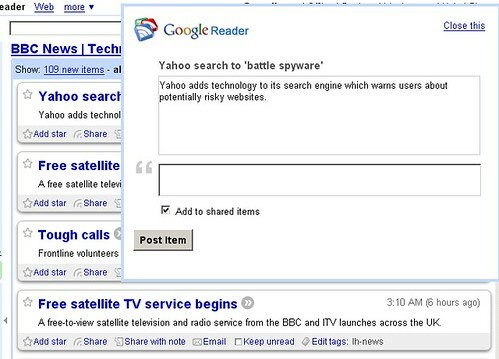 In other words, it's a feature that Google Reader users have been waiting for. On your sidebar, now you can click on "Notes" (under "Your Stuff" to see your friends' shared notes. Since the feature is brand new, none of my friends are using the notes yet, but I expect that to change in the near future. Overall, the response has been overwhelmingly positive, but a lot of people who are testing the feature out are unable to find a "Delete Note" button (or even an option to edit the note), so be careful when adding notes -- for now, they appear permanent! Previous story: Are Long URLs Spammy?